Pilates classes are now available at The Cherington Practice. These classes are physiotherapist led by Claire Smith, Chartered Physiotherapist, with a limited number of participants to ensure that all clients are supervised and to enable variations of exercises for differing needs. The majority of exercises in these classes are taught on mats on the floor, but we also do some work in standing to challenge upright posture. What are the advantages of a physiotherapist led Pilates class? Following many requests from our patients we decided to start running specialist Pilates classes. We received feedback that those with pain or injury were looking for a class where the instructor would have the specialist skills and reasoning to be able to accommodate their injury, while guiding them to exercise in a safe and beneficial way. We often heard the story of being put off exercise classes due to not managing the level of exercise that was involved, hence feeling discouraged, or being in a class so large that they didn’t feel looked after. We want to get you enjoying exercise in a comfortable environment, where you have trust in the instructor’s physiotherapy expertise and exercise prescription. 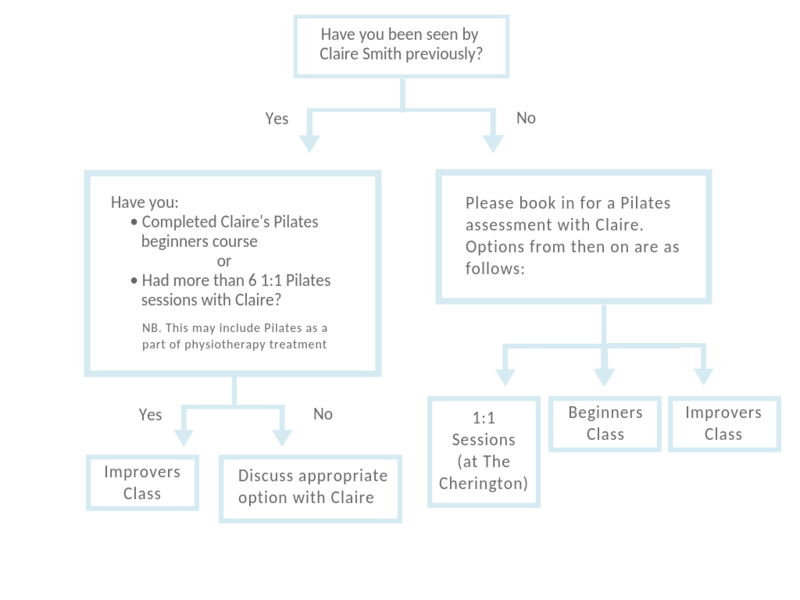 Prior to attending any of our classes, you will need to have a 1 to 1 Pilates assessment with Claire. The purpose of this session is to ensure you are familiar with the principles of Pilates, to discuss any pain or injury, to assess your level of ability and establish any personal goals you wish to work towards. We can then decide together which class you are suited to best, or advise 1 to 1 sessions if we feel this is needed. £44 for 30 minute assessment. These sessions may be more appropriate for you if you are actively undergoing physiotherapy treatment for a new onset of pain or a new injury. You may also prefer 1 to 1 sessions if you are looking for a personal experience where all exercises are tailored to you and your needs. You will be given exercises to practice between sessions, sent to you via email with pictures, videos and detailed instruction. Physiotherapy treatment can be included in these sessions if needed. £42 for 30 minutes, £70 for 60 minutes. This class is appropriate if you are new to Pilates. It runs as a 6 week course to enable gradual progression of all participants. The aims of the course are to establish the principles of Pilates, strengthen your core muscles and give a gentle full body workout. Claire will be aware of any pain or injury following your initial Pilates assessment so will cater for your individual requirements throughout the course. £100 for 6 week course (includes Pilates assessment worth £44), after course completion £12 per class or £60 for block booking of 6 classes. Upcoming course start dates: 25th Feb 2019; 8th April 2019 (please note this will not be 6 consecutive weeks due to bank holidays 22nd April, 6th May & 27th May). This class is appropriate if you have attended our 6 week beginners course, or if you have previous Pilates experience. These sessions will be mixed ability, providing exercises of varying challenge to suit your needs. The aim is to continue to strengthen your core and give a full body workout. This will run as a rolling program, where you can book to attend blocks of classes, or attend as and when you wish. We are able to cater for those with pain or injury in this class. £12 per class or £60 for a block booking of 6 classes. Claire will be carrying out Pilates assessments and classes. She has used Pilates as part of her physiotherapy treatment and rehabilitation throughout her career. She started teaching classes when working in central London which involved mat work and equipment such as Pilates reformers. She carried out formal training through the Australian Physiotherapy and Pilates Institute and has gained certification following theory and practical examinations. She is passionate about Pilates and enjoys teaching all levels of varying needs, whether 1 to 1 or in a class environment. For more information about Claire’s experience and career, please click here. It is advisable to have a small snack 1-2 hours prior to the class to ensure you have some energy! Please wear comfortable stretchy clothing that does not restrict movement, and socks but no footwear. Pilates socks would be useful if you have them – these are socks with grip on the soles that assist with some of the exercises, however this is not essential. 1 to 1 sessions are held at The Cherington Practice. Beginners and Improvers classes are held at St Peter’s Church Hall in Henleaze.